Only a single fundster made it onto a trade publication's new list of "innovative leaders of the financial advice industry." 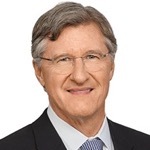 Yesterday InvestmentNews named John Streur, president and CEO of Eaton Vance's [profile] Calvert, as one of 11 Icons & Innovators for 2019. The list also includes a key fundster-adjacent CEO, Kunal Kapoor of Morningstar. The sole icon on this year's list is Sheryl Garrett, founder of Garrett Planning Network, an advisory firm. The eight other innovators include: the co-founder and CEO of a 401(k) plan advisor (KPA) RIA; the CEO of a tech ally to FAs; the chair of a B-D network; a wirehouse's tech guru; an aging-focused academic; and three more advisory firms' chiefs.